Patch 7.1 has been out for about a day in the US and half a day in the EU. The biggest changes in the patch from a gold-making point of view is the new Blood of Sargeras Trader and a new potion recipe. My thoughts on the Effect of the Blood of Sargeras trader can be found here. I seem to have completely underestimated the impact from the new potion recipe on the price of herbs. 1 Blood of Sargeras will give 10 potions. If you were to craft Potions of the Old War instead you would use way more materials than you can get from the Blood of Sargeras trader. By looking at data from the US realms we can now start seeing the major trends. As Expected Herb supply is going up, and with demand falling sharply prices are going down. Pictured below are the amounts and prices for Fjarnskaggl, Foxflower and Starlight Rose for US Region. The patch launch coincides with a large drop in price and increase in quantity. I dont think the prices will be recovering particularily much, although it depends on what you believe the value of a Blood of Sargeras will converge to. Personally I think the blood value seems reasonable at about 150 gold, which would indicate an even further dropoff. 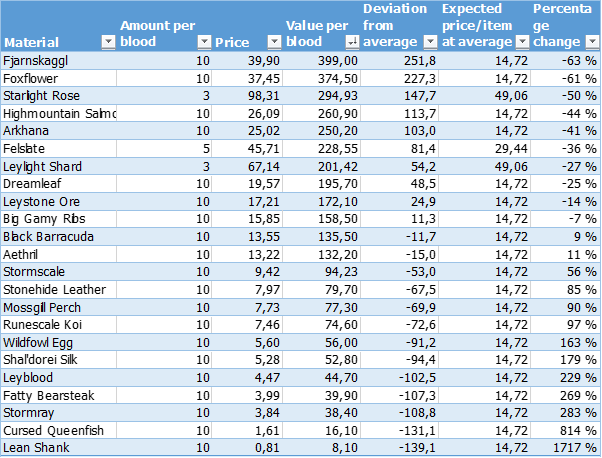 From redoing my spreadsheet here it seems the values have been going down across the board, atleast for the items that give the best return per blood. The average value is now at 147 gold per blood. Over time we would expect the extreme values to trend towards this average. With the new potion as well this is looking quite likely for the herbs. Prices on herbs are most likely to keep falling as demand starts really dropping of as people start using the new potion. Obliterum has been going up so far and is looking very profitable at the moment. The blood trader has taken a ton of bloods out of the economy, and Bloods are used in all the most efficient ways of crafting obliterum (Alchemist Stones, Enchanting relics etc.). In addition to an increase in demand as you can use 8 Obliterum per item, not to mention the fact that no rep requirements for World quests and Suramar dungeons for Alts means that crafted gear should see a slight increase in demand. Materials in general should still be on a downwards slope however, so dont expect crafted item prices to rise. Sinde the 22nd, supply has gonde down by 25%, and the price is up from 2500 to 3600 for US. I strongly suggest that you look into shuffling cheaper trade goods into obliterum through any profession you have access to. I will be making large amounts of rings personally, as I’m a jewelcrafter. As I have noted earlier, Felslate has 3,5 times the amount of gems per prospect compared to Leystone. The Trader however offers you 1 Felslate per 2 Leystone Ore. This means that Felslate is tons better to buy from the Trader. Expect felslate to go down. Prices on gems will probably go down because of this. I think Felslate will be the way to go for this week in terms of prospecting. Make sure you run your servers prices through my spreadsheet to make sure you’re making a profit on average. Il go a bit more in-depth in Felslate versus Leystone later, but for now, Get on the resurgent Obliterum train if you can!